Glow Party – ActiveDark.com – Glowing Ideas! Previously we covered the simple idea of having a ‘Glowing Pool Party with Glow Sticks in a Pool!‘ Today, we want to expand on that with some other great thoughts on how to make your Pool Party truly GLOW! After posting the original article, we discovered ourselves in a dark backyard with a very dark above ground pool and a small army of kids who did not want to give up the pool party fun just because the sun went down. So we quickly dug into our bag of glow and came up with some fun glow products that kept the pool time going for hours with a whole new level of fun!! The easiest and most affordable addition to any pool party is of course Glow Sticks. All traditional glow sticks are waterproof, most float and are perfectly safe for use in a pool. Some common Glow Sticks for pool use include 4 Inch Glow Sticks or 6 Inch Glow Sticks, Glow Bracelets and Glow Necklaces! The greatest addition we came up with were these Waterproof LED Decor Lights that come with a remote control and a whole array of color selection and modes. By tossing in a couple of these simple Submersible Decor Lights, our pool suddenly came to life with brilliant glowing colors! The kids came up with all sorts of games on their own like Scramble for the Color! The parents kept the remotes and were able to shift colors and turn on Rainbow Color Mode from outside the pool. This is the best option for adding very bright colored lights to any pool that does not have its own lighting. Another great addition to any pool party are of course beach balls, so what better than Beach Balls with Glow Sticks! There are variety of glowing beach balls out there, some come with LED Light Sticks. As mentioned above about using LED Light Sticks in water , we always suggest to stick with the Beach Balls that come with traditional Glow Sticks as Inserts when using them in water. Add a few of the these glowing beach balls to the pool and watch the fun glowing action! You could also utilize one of our previous ideas and add some wacky ‘Super Spaghetti Glow Balloons‘ to the pool for your Glow Stick Pool Party! To leave you off, we’ll post a great video we stumbled upon on YouTube showing a fantastic Glowing Pool Party! Have fun this summer with your GLOWING POOL PARTY! Glow Party Decorations – Glowing Treat Ideas! Liven up your party with glowing party snacks and treats! Here we will highlight a couple simple additions for your standard birthday and party snack treats that will surely make them shine! 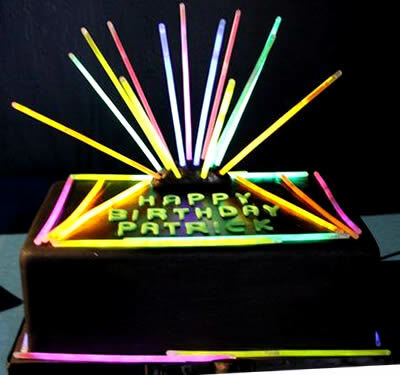 How about adding some simple glow sticks to your cakes and cupcakes for a wonderful glowing treat! Or use looped glow necklaces to wrap around a food platter for a glowing cupcake display. Note: If you plan to use glow sticks in any edible products, it is always best to choose a higher quality brand of glow sticks. 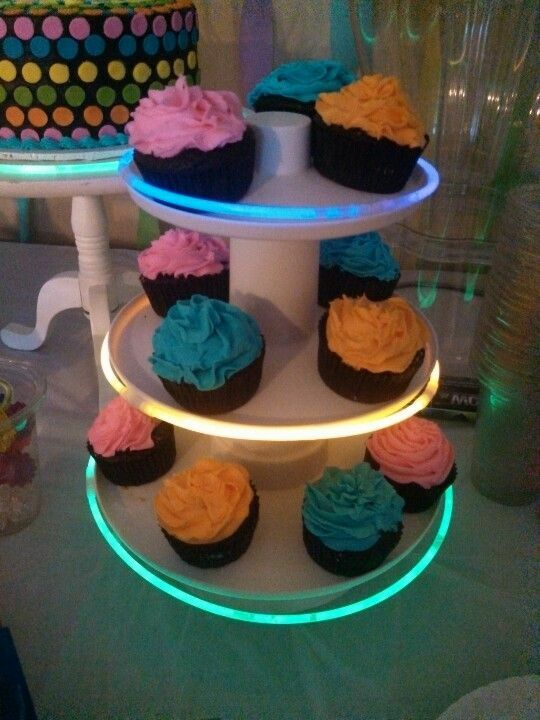 We find that the best choice for cupcakes and cake displays are glow bracelets. When purchasing glow bracelets, be sure to check that the thickness of the glow bracelet is at least 5-6mm in thickness or larger. This is to ensure that you receive no cracked or leaking glow bracelets. 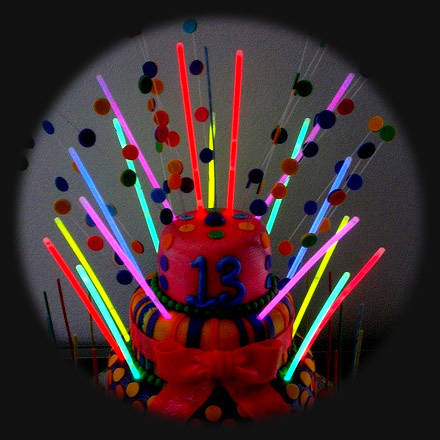 It is always advisable to clean the glow sticks with warm water and soap prior to placing into any edible food items. Another really easy addition to any snack bar is a big bowl of glowing candy! 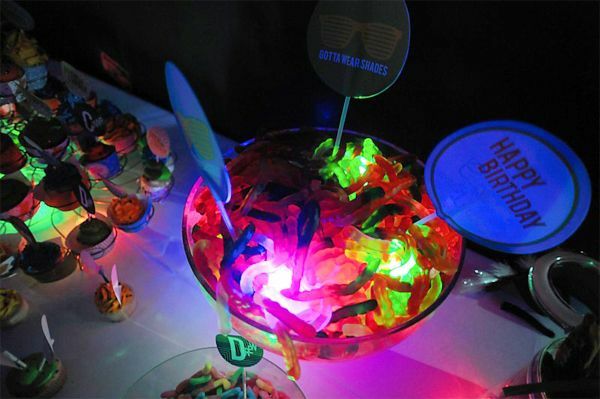 Simply add a few glow sticks to the bottom of a bowl and fill it with delicious gummy candies. The glow effect will shine through the gummies to create a cool and fun lighted candy bowl! Again, be sure to wash your glow sticks with warm water and soap prior to placing in the bowl. Are you planning on making some homemade cotton candy for your party? 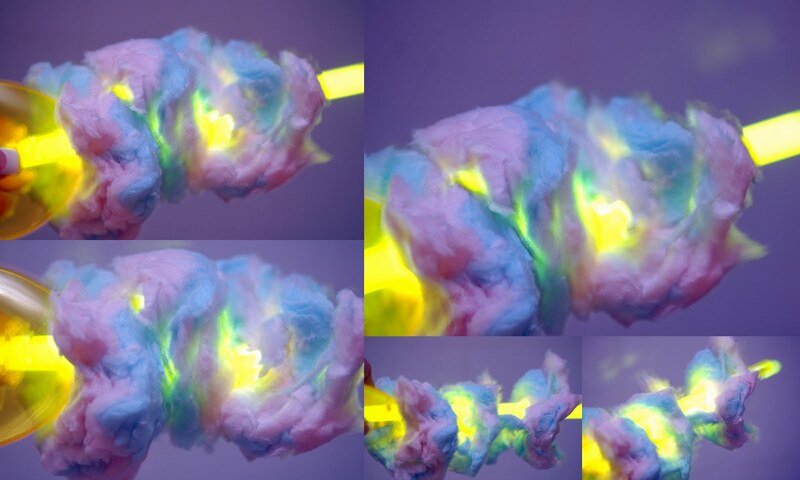 What about adding an extra something to your candy floss by making it glow! Simply use large glow sticks or LED cotton candy light sticks as handles for your cotton candy floss and make your party the brightest ever! Battery operated light sticks might be best suited for this one since you can turn them off and have them prepared before the party and not worry about your ‘glow running out’ before the party even starts! For additional ideas on how to make your snack bar glow, be sure to check out our articles on Glowing Party Drinks, Light Up Glowing Cherries and Lighted Displays and Punch Bowls! Glowing Centerpieces & other Glow Party Highlights!! Brighten up your next big glow party or formal event with glowing centerpieces, punch bowls and other party highlights! Here we will explore some great LED products that can help you add some glow to your next wedding, reception, bah mitzvah, cocktail party or backyard gathering. Decorative LED Tea Lights are the easiest way to really make your tabletop centerpieces, floral arrangements, ice sculptures or punch bowls shine! These Decorative Lights are waterproof so they will work in any type of liquid or ice. With replaceable batteries, these bright LED Lights can be used again and again. Another LED highlight that can be used for liquid based displays are these fun Light Up LED Ice Cubes. Add these simple lighted cubes to your punch bowl for a cool glowing effect. Mix a few of these glowing ice cubes up with decorative water lights inside your ice bucket to really make it shine. LED Ice Cubes come in a variety of colors and even a multiple setting multi-color version. Other great glow party highlights always include these bright and safe LED Flameless Candles and of course, the ever popular, battery operated Fiber Optic Centerpiece Lamp! So you’ve got your glowing balloons and light up drinking glasses all set. You have some fun glow in the dark games and glow crafts planned but what else is missing from your next big glow party? How about your party-goers? Are they lit up like the rest of your party? One way to really brighten up this party now is to add some light to all of your party guests! 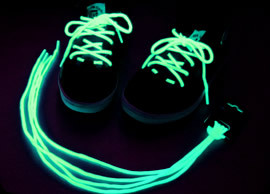 There is a vast amount of glow in the dark and LED lighted products out there perfect for glow party wear. Having a glow in the dark costume or theme party? 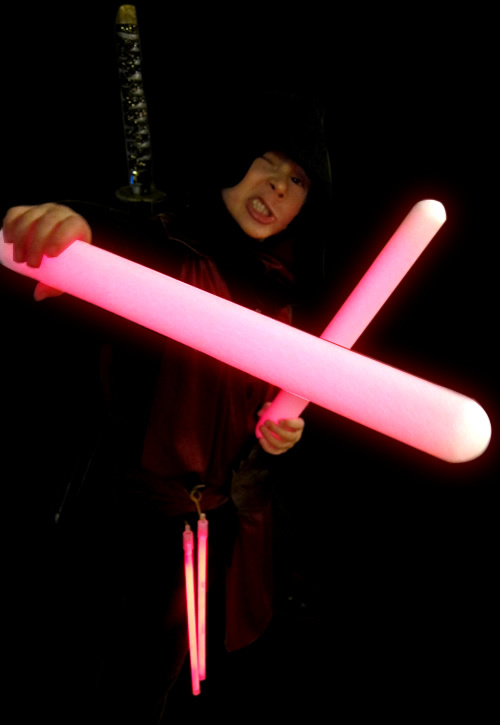 Looking for some form of accessory for the ultimate glowing sword, lightsaber, glow in the dark nun-chuks or lighted bo-staff? How about some really big glow sticks?! Large Glowing Batons and 15 Inch Glow Sticks make for some pretty cool looking and extremely bright glow accessories. Many large glow sticks and wands come with nice foam encased coverings so Mom and Dad can relax while handing out the lightsabers! Not only can Glow Sticks be used as a hand-held accessory, but they can also be used as general decorations or costume highlights. Try using some Glow Stick Necklaces by connecting them together and fashioning yourself a cool glowing belt, lasso or glowing outlines to your themed costume! Glowing Finger Rings, LED Pendants and Body Light Pins. There is a large assortment of glowing jewelry out there, especially in the way of light up finger rings and glowing pendants. Check out the images below for some great themed ideas and products for lighting up your party patrons. There are several wearable items on the market that allow you to program your own message or messages and have them scroll across the display with bright LEDs. These include T-Shirts, Dog Tags and Belt Buckles! 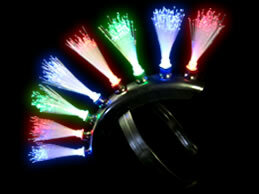 Not only are pendants, rings and bracelets suitable for glow parties. 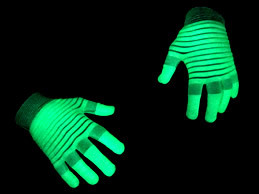 Here are a few other specialty items that glow or have LED lights that are great additions to your glowing party including the ever cool Fiber Optic Mohawk, Glow in the Dark Gloves, Glowing Shoelaces and LED Bangle Bracelets. As a final note: A party is not a party until someone is wearing a fully functional equalizer shirt that beats to the music! Check it out below!